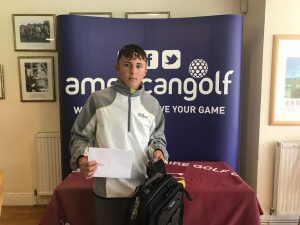 Cardiff junior golfer Jacob Harrington-Wara has won through to the final of the American Golf Junior Championship for a second year running with a hugely impressive display in the Gross score category at the regional qualification at Glamorganshire Golf Club. The talented youngster, who finished runner up in the 2016 final, hopes to go one better this year and has started off well with a fantastic display at qualifying. Jacob put in a fantastic display in the category which offers no help from a handicap. He carded a superb round of level par which left him six shots clear of Berkshire junior Charlie Roper. He now progresses to the National final on 16th August at Gainsborough Golf Club, headquarters to golf manufacturer Ping, where he will take on qualifiers from all over the U.K. and Ireland for the coveted trophy. Entry to all of the American Golf Championships, including the Junior Championships, is completely free and is part of the nationwide retailer’s drive to promote the game of golf and get more people out playing golf more often.